We’re open to ongoing learning. 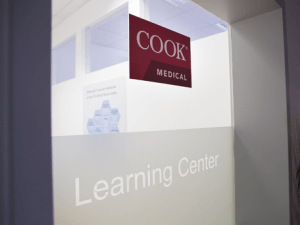 Cook Medical’s recently opened Learning Center in Monchengladbach, Germany, is another example of our global initiative to partner with healthcare professionals and provide product education opportunities. The renting, renovation, and customization of a dedicated space for training has expanded the reach of our Vista℠ programs and strengthened our resolve to better equip physicians. The facility has separate training spaces for our Interventional Radiology, Lead Management, and Urology clinical divisions in addition to housing the office for Cook Deutschland. The Urology suite has two separate spaces, one with a “roundtable” setting for engaging discussions and presentations, and a second designed to host hands-on trainings, complete with anatomical models for product demonstrations. Since its opening in May 2014, the Learning Center has been in constant use. In the future, we envision a full calendar of onsite events, such as procedural training courses across various skill levels. 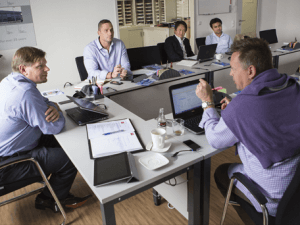 At these courses, physicians will learn from leading urologists and practice techniques by using our latest innovations. The collaboration and sharing of best practices make this facility more than just four walls and a roof. When relationships start and learning takes place, the facility comes to life with endless potential. Our hope is to create an environment where knowledge is gained and where physicians and industry can come together to work towards the common goal of improving care. To learn more about our Vista programs or to register for an upcoming course, visit vista.cookmedical.com.